Gentium (Latin for “of the nations”) is a Unicode serif typeface designed by Victor Gaultney. Gentium fonts are free and open source software, and are released under the SIL Open Font License (OFL), which permits modification and redistribution. Gentium has wide support for languages using the Latin, Greek, and Cyrillic alphabets, and the International Phonetic Alphabet. Gentium Plus variants released in November 2010 now include over 5,500 glyphs and advanced typographic features through OpenType and Graphite. The original release of Gentium defined roughly 1,500 glyphs covering almost all of the range of Latin characters used worldwide, as well as monotonic and polytonic Greek, designed to flow in harmony with the Latin. Gentium comes with a variant called GentiumAlt (“Gentium Alternative”), which contains flatter diacritics intended to improve the appearance of letters with multiple diacritics, as well as a glyph variant of the Greek circumflex that resembles an inverted breve. An updated version of the roman and italic fonts called Gentium Plus, which includes the full extended Latin, IPA, Greek, and Cyrillic coverage, was released in November 2010. Gentium Plus variants containing an additional 3,800 glyphs, including Cyrillic and additional coverage of the International Phonetic Alphabet, were added in 2010 in a release called Gentium Plus. Released shortly afterward was a variant called “Gentium Plus Compact,” which has compact spacing for aesthetic reasons. Both Gentium Plus and Gentium Plus Compact include regular and italic variants of over 5500 glyphs. Since the initial release of the Gentium Plus fonts, the focus of the project has shifted to completing bold and bold italic weights of the Gentium Plus family, as well as the creation of a “Gentium Book Plus” family with a slightly heavier weight which may be useful at small sizes. These are the weights that are currently available in the Gentium Basic and Gentium Book Basic fonts. The ongoing development of the font welcomes contributions from its users. 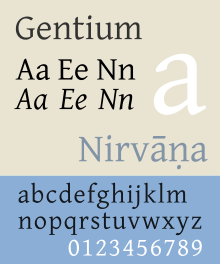 Gentium was released under the Open Font License on November 28, 2005. Other typefaces released under the OFL include Charis SIL and Doulos SIL. ^ “Gentium Plus: Documentation and Support”. ^ Byfield, Bruce (January 26, 2006). “Gentium: An award-winning font joins the free software world”. Linux.com. Archived from the original on January 13, 2010. ^ a b Gaultney, Victor (November 1, 2010). “Gentium Basic Fonts”. SIL.org. Retrieved February 23, 2012. ^ a b Gaultney, Victor (November 1, 2010). “Gentium — FAQ”. SIL.org. Retrieved February 23, 2012. ^ Gaultney, Victor (November 1, 2010). “Gentium — Project Status”. SIL.org. Retrieved February 23, 2012.